Freddie Mercury’s 65th birthday took place on September 5th, where former Queen members Brian May and Roger Taylor celebrated at a charity event in London’s Savoy Palace. Other celebs that also joined in the auction for The Mercury Phoenix Trust included Ben Elton, Fearne Cotton, Chris Evans, Stephen Fry, Matt Lucas and Nicola Roberts. 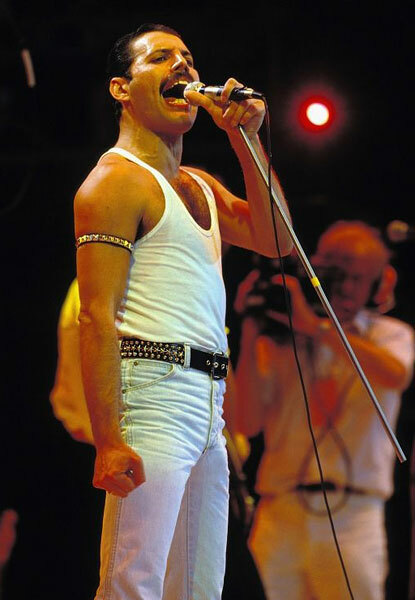 Freddie Mercury died of AIDS-related pneumonia on November 24 1991. The Mercury Phoenix Trust raises money to help the world-wide battle against HIV and AIDS. Brian May paid tribute to his dear friend Freddie on an especially created Google blog. He wrote: Freddie would have been 65 this year, and even though physically he is not here, his presence seems more potent than ever. Freddie made the last person at the back of the furthest stand in a stadium feel that he was connected. He lived life to the full. He devoured life. He celebrated every minute. And, like a great comet, he left a luminous trail which will sparkle for many a generation to come. Happy birthday Freddie! May wrote kind words of his former band-mate, saying that “Freddie was fully focused, never allowing anything or anyone to get in the way of his vision for the future. He was truly a free spirit. There are not many of these in the world. To achieve this, you have to be, like Freddie, fearless, unafraid of upsetting anyone’s apple cart”. May wrote warm-hearted words of his former bandmate’s attitude and approach to song-writing, calling him a “free spirit”. He also said that “to create with Freddie was always stimulating to the max. He was daring, always sensing a way to get outside the box”. This entry was posted on Tuesday, September 6th, 2011 at 9:24 am	and is filed under Music News. You can follow any responses to this entry through the RSS 2.0 feed. Both comments and pings are currently closed.